Congratulations to our latest Trumpet & Horn happy couple, Siobhan & Ben! 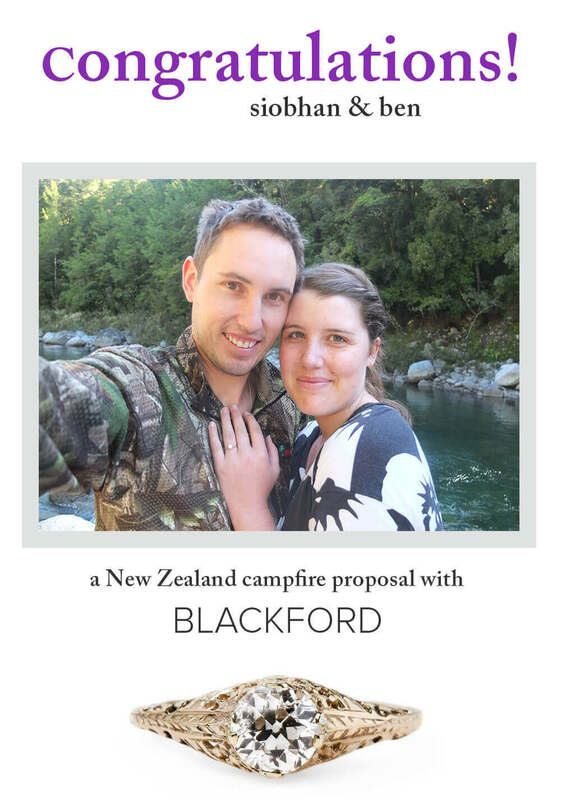 These lovebirds from down under were engaged over New Years with the beautiful yellow gold Edwardian solitaire ring, Blackford. Ben and Siobhan started dating when she was 15 and he 16 —almost TEN years ago! Siobhan has always loved vintage jewelry and knew that she'd want an antique engagement ring. One day she stumbled upon the Blackford ring on our website and knew it was the perfect one for her. She sent an inquiry to our concierge and put us in contact with Ben. She tried to put it at the back of her mind and forget about it, but kept sneakily coming back to check the status and watch its glittering product video. Fast forward a few months to the holiday season. The pair decided to go for a five day hiking and fly fishing trip in the beautiful Kahurangi National Park in Tasman, South Island, New Zealand (think Lord of the Rings country!). The first day of the trip, Ben surprised Siobhan with a helicopter ride over the park. But that was just the first surprise of the trip! The second day (which was New Years Eve) was spent at the beautiful Venus Hut. At about 10pm, Ben suggested they build a campfire and have hot chocolate and marshmallows. With the stars out in full force, and no one else around for miles, Ben presented Siobhan with the most beautiful ring she'd ever seen (her Blackford, at last!) and asked her to marry him. Of course she said YES! This was followed by three more blissful days of tramping through beautiful beech forests, swimming and fishing in pristine rivers. In other words it was perfect. And as icing on the cake, Ben got a couple of brown trout which made him very happy.